More wet weather days expected in the first fortnight of September 2018. Expect thundery showers in the late morning and early afternoon on 6-8 days, and in the morning on 1-2 days. A few warm days can be expected. Singapore, 31 August 2018 – The prevailing Southwest Monsoon conditions are expected to persist over Singapore and the region, with the low level winds blowing from the southeast or southwest. 2 In the next fortnight, Singapore and the region can expect more wet days. During the period, thundery showers are forecast over Singapore mostly in the late morning and early afternoon on six to eight days. In addition, the passage of Sumatra squalls could bring widespread thundery showers accompanied by gusty winds in the morning on one or two days. 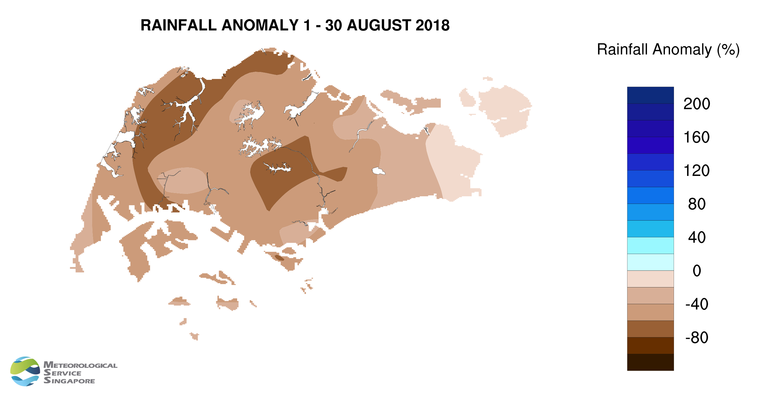 The rainfall for the first fortnight of September 2018 is likely to be near average for many parts of Singapore. 3 On most days in the fortnight, the daily temperature is forecast to range between 25°C and 33°C. On a few days with little or no rainfall, warmer conditions with maximum temperatures of around 34°C can be expected . 5 In August 2018, Southwest Monsoon conditions persisted over the region, and the low level winds were blowing predominantly from the southeast or southwest. 6 Compared to the first fortnight of August 2018, the second fortnight of the month was wetter due to a return of shower activities in the region. During the month, the thundery showers fell mostly in the late morning and early afternoon, and the highest daily total rainfall was 90.3 mm recorded at Bukit Batok on 22 August 2018. On that day, large-scale wind convergence brought widespread moderate to heavy thundery showers between the morning and early afternoon. 7 The warmer conditions experienced in the first half of August 2018 gradually eased in the second half of the month with the return of shower activities. On most days in August 2018, the highest daily maximum temperature ranged between 31°C and 33°C. Warmer temperatures were experienced between 11 and 15 August 2018 and on 27 August 2018, with the daily maximum temperature ranging between 33.9°C and 34.9°C. The daily minimum temperature in August 2018 ranged between 23°C and 27.1°C. 8 Well-below normal rainfall was recorded across the island in August 2018. The lowest rainfall of 43.7 mm (78% below average) was recorded at Choa Chu Kang West. Rainfall was highest at Changi where 121.4 mm (17% below average) was recorded.